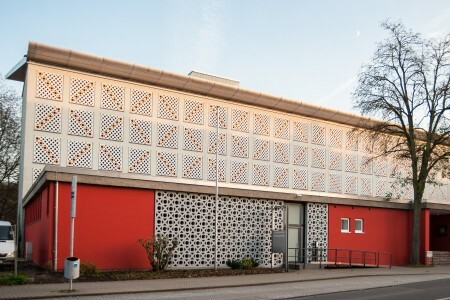 The Treasury of the Trier City Research Library holds treasures of rare books of the greatest value and international ranking. 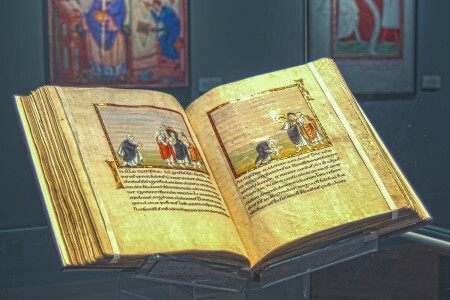 Three of the most significant exhibits of the especially interesting permanent exhibition is the "Codex Egberti," listed on the UNESCO Memory of the World, the "Ada Evangeliary," and the "Trier Apocalypse." The most outstanding printed works are the "Gutenberg Bible," the Mainz "Catholicon," the earliest printed encyclopedia, and a "Fish Calendar," the only such documented almanac worldwide, printed around 1493. Also of great significance are the magic and healing incantations from the Middle Ages, the many splendidly illuminated codices, the texts from medieval "scientific" literature, or the original manuscripts of Nicolas of Cusa, Johann Wolfgang von Goethe, Karl Marx, and other famous personalities from earlier ages. The treasury chamber is supplemented by documents from the city’s history and the Trier Electoral State as well as the magnificent baroque Coronelli globes. A visit to the Treasury offers you a fascinating insight into art and culture of the Middle Ages up to the pre-modern. 04/22/2019: 00:00 a.m. Closed ! 05/04/2019: 10:00 a.m. - 5:00 p.m.
05/07/2019: 10:00 a.m. - 5:00 p.m.
05/08/2019: 10:00 a.m. - 5:00 p.m.
05/22/2019: 10:00 a.m. - 5:00 p.m.
05/28/2019: 10:00 a.m. - 5:00 p.m.
06/08/2019: 10:00 a.m. - 5:00 p.m.